The Herisem walking trail highlights the industrial heritage of the Molenbeek valley. Starting at the cultural centre CC de Meent in Alsemberg, it heads to the Ducal Church of Our Lady of Alsemberg. 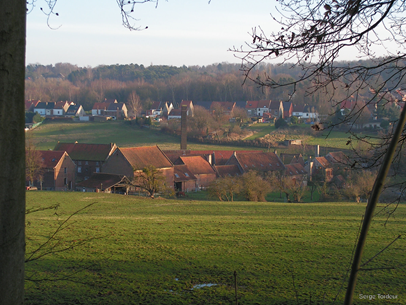 Perched on top of the famous Kerkenberg, the Church of Our Lady with its distinctive, monumental spire overlooks the surrounding landscape. Inside the church is a rich collection of art treasures, with behind the altar the miraculous statue of Our Lady of Alsemberg as the main showpiece. Further down the trail, on the banks of the Molenbeek, lies the old industrial complex of the Herisem mill. This complex, to which the trail owes its name, is a well-preserved remnant of the once flourishing cardboard and paper industry along the Molenbeek. Be sure to pay a visit and discover how life was in a 19th-century paper mill. Past the Herisem mill the walking trail winds a few hundreds of metres through the Molenbeek valley via the Duivelsborre, before curving north toward the Begijnenbos. It then runs along the Elsemheide, from where you have a stunning view of the Molenbeek valley, back to the centre of Alsemberg. You can wrap up your walk in the Visitor Centre, where you will get an introduction to lambic beers and can afterwards head to the tasting corner for a delicious Oude Geuze or Oude Kriek.